Is This The World’s Ugliest iPad App? Here, ladies and gentlemen, for your viewing pleasure, is an example of open-source “design” at its finest. From the retro desktop-style interface through to the clunky name — Documents Unlimited PDF & Office Editor Apps for iPad — not a single aspect of this experience has been left untouched by the clunky hand of open-source UI design committees. In fact, I would like to award it the newly-minted title of Ugliest iPad App, Like, Ever (or UiALE for short). As befits such an aesthetically challenged iPad app, Documents Unlimited is a Microsoft Office-compatible suite. If you were to travel back to 1995 and describe the iPad to somebody, this is what they’d imagine all apps would look like. It has tiny buttons which would be tricky targets for a mouse pointer even on a 27-inch screen, and are here rendered as mere pinpricks of icons on the iPad’s 10-inch display. In fact, it even incorporates a “mouse mode” to help you actually hit your targets. What Documents Unlimited does have is compatibility with pretty much every Microsoft document around today, from Microsoft Word 2010 back to Microsoft Powerpoint 97, which should let you live in the past for as long as you like. The app is really more of a front-end to the sever-based LibreOffice apps than an app in itself. 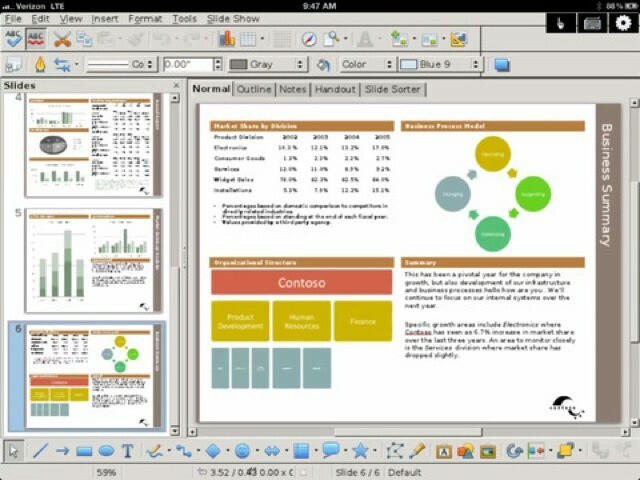 LibreOffice is the online cousin of the desktop suite OpenOffice. And before we get too caught up in the fugliness of the app itself, it does at least bring a few modern touches, such as Dropbox, BoxNet and Google Docs integration. But the biggest joke is the price: $20 (currently on sale for $5). I have a whole lot of $20+ apps on my iPad, and when they’re as polished and useful as, say, Omnifocus, I’m more than happy to pay. But $20 for what is essentially a fancified browser showing a web view of a 15-year-old office suite? No thanks.